"One year to the day that I lost my arm, I got a text from my doctor saying, 'Hey, we got an arm for you'"
A man who had his arm ripped off in a fall from a staircase is learning to live with a new arm he received in a rare transplant. News4's Chris Gordon has his story. 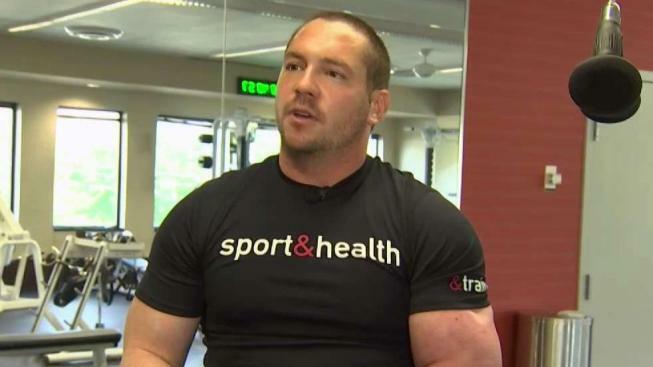 Four years ago this month, a Virginia man lost his left arm in a terrible accident. Now the recipient of a rare arm transplant, he works out every day and is gaining function in his new limb. Jeff Swedarsky, 37, had his arm torn off in a fall at a D.C. hotel in June 2014. He was walking up a spiral staircase when he started to tumble headfirst over a railing. He still doesn't know how it happened. "Initially falling, I was going head and back first, feet in the air. I was going to hit the ground -- 40 feet. I would be dead," he said. "So, somehow, something in me just grabbed [a railing]. It took all the motion away and straightened me up, but unfortunately it just tore my arm crazy off." Swedarsky broke his fall, but his left arm was entirely ripped from his body. Shocked, his friend used a belt as a tourniquet to staunch the bleeding, news outlets reported. Swedarsky's friend put the severed limb on ice in a cooler they had been carrying. In multiple surgeries, doctors reattached the arm. But, ultimately, it needed to be removed. A year after what Swedarsky called a "freak accident," his doctor at Johns Hopkins Hospital's Comprehensive Transplant Center had news. "One year to the day that I lost my arm, I got a text from my doctor saying, 'Hey, we got an arm for you.' I've still got that text," Swedarsky said. He spoke with News4 on Thursday at his gym in Old Town Alexandria, during one of his intense daily workouts. He received the left arm of a 40-year-old man who died in Philadelphia. The transplant is one of less than about 85 arm and hand transplants performed worldwide, Johns Hopkins says. The transplanted arm looks and works a little different from Swedarsky's own arm. The lower part of the arm is muscular, but the top has loose skin. Swedarsky says when he first had the arm, the skin was hairy and rough. The lower arm was skinny, and the top was heavy. Gradually, it looks more like his own. And on portions of the arm, he can feel a breeze. Swedarsky exercises every day and can now lift 80 pounds. That took him a year to work up to. His goal is to "get everything back and then some."